This soup is creamy and smooth, and has a mild bite to it from the curry and ginger, which helps you stay warm during chilly fall nights. Its bright colours will make you smile, and it will also give you all the beta carotene and Vitamin A that you need to stay healthy and fit during flu season! If it were down to food and people positivity, I'd be living in Thailand. If I had to eat only one meal a day, it would be an intense battle between pasta and green thai curry. Good curry not only tastes amazing, but it also gets your metabolism going, improves blood circulation and boosts your immune system. Needless to say, I jump at every opportunity to eat at a Thai restaurant. But one thing has been bothering me: I just don't really know what ingredients go into my food, not to mention the quantities of processed vegetable oils or sugar. I tried for the longest time to recreate a decent traditional green thai curry at home that tastes exactly like the one I get at thai restaurants. I've always failed, until now. 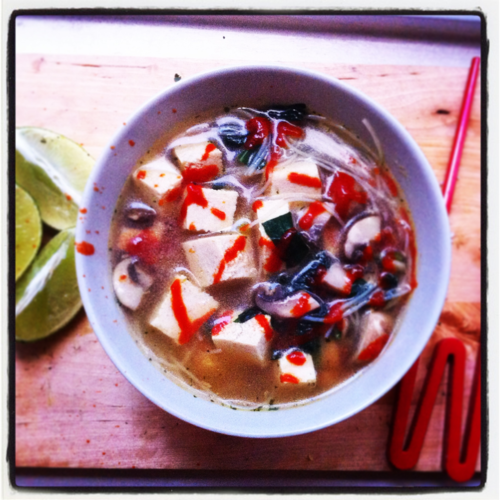 I'd like to share my easy, vegan and oil-free Green Thai Curry Recipe. Serves 1-2| Prep time: 20-30 min. Throw the green thai curry paste in a pan and add half of the coconut milk on medium heat, let it bubble until it becomes fragrant for a minute. Add the galangal, lemongrass, xylitol, thai basil + lime juice and reduce to a low heat. Add the rest of the coconut milk and vegetables except your leafy greens as they tend to cook much quicker, let all simmer until your vegetables are tender. Add your leafy greens, give it a taste test and add chillies or tamari sauce, if it's not spicy/salty enough. Top with more thai basil, lime and spring onions. Enjoy it hot and spicy! This post is part of Zoë’s September Recipe Round-Up. Check out her PumpUp recipes here, follow her blog, and follow her on PumpUp @zoedesborough. Chop/grate and prep all your ingredients first, it will make your life much easier. Add a glug of vegetable oil to a large pot on medium heat and add your ginger, garlic, onions, and mushrooms and sauté for a few minutes. If you have pho bowls, great! If not, you’ll want a deep bowl and serve with the garnishes on the side so everyone can customise their own soup to their own taste! This is a vegan (unless you use chicken broth) soup, you can totally add pre-cooked chicken, pork, beef, and tofu. My mom likes adding carrots and other things in hers, but I stick to this recipe… It’s a great substitute to Chicken Noodle Soup.